With plenty to satisfy – a five-figure surprise, a decent selling rate and a £400,000 hammer total from 470 lots – auctioneer Douglas Girton fixed on another aspect of his Edinburgh furniture sale. “The most encouraging thing, I thought, was to see the Americans back in action,” he said after Lyon & Turnbull’s (25% buyer’s premium) September 5 sale. US bidders, although backed by the currently strong dollar, bought in the lower ranges while playing their part as underbidders on other lots. 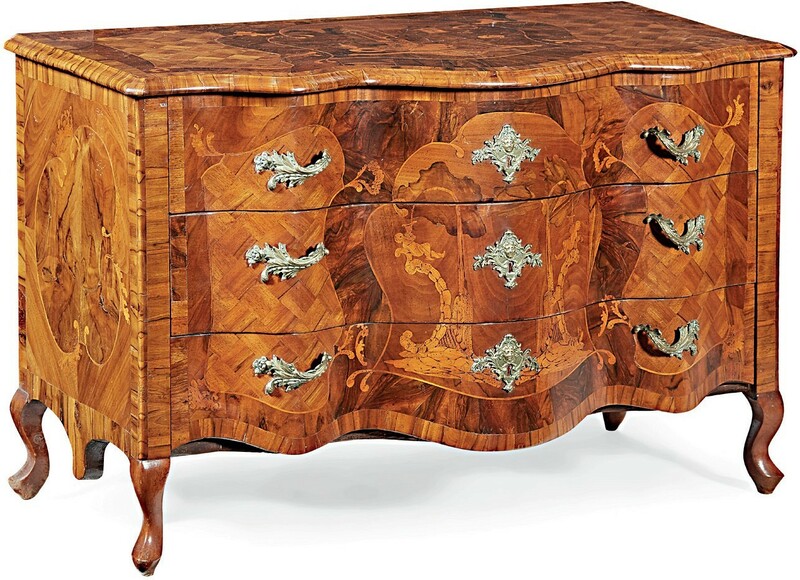 It was Germans and East Europeans who took over bidding for an 18th century south German walnut, marquetry and parquetry serpentine commode. The 4ft (1.22m) wide commode was part of a consignment of fairly modest pieces from a country house in Argyll and was estimated conservatively at £1500-2500. Those German and Eastern European connoisseurs saw it online and identified the commode as the work of the Spindler brothers. Johann Friedrich (1726-1812) and Heinrich Wilhelm Spindler (1738-88) were celebrated makers of marquetry furniture and were patronised by Wilhelmine, Margravine of Brandenburg-Bayreuth, whose taste gave rise to the description Rococo Bayreuth. “The Spindler brothers are still hugely admired in Europe but much less well known in the UK,” said Girton. At a Sotheby’s sale in Amsterdam 10 years ago, a marquetry commode brought a premium-inclusive €108,750 (then about £94,000). The Edinburgh example, with a central marquetry panel of a dolphin and figure spouting water in a landscape, was perhaps not as fine as that piece but, after an online and phone battle, it sold at £25,000. Another Continental piece from the same vendor was a Hispano- Flemish tortoiseshell cabinet on stand. The 18th century piece had some 19th century embellishments including the gilt brass figures to the gallery rail. 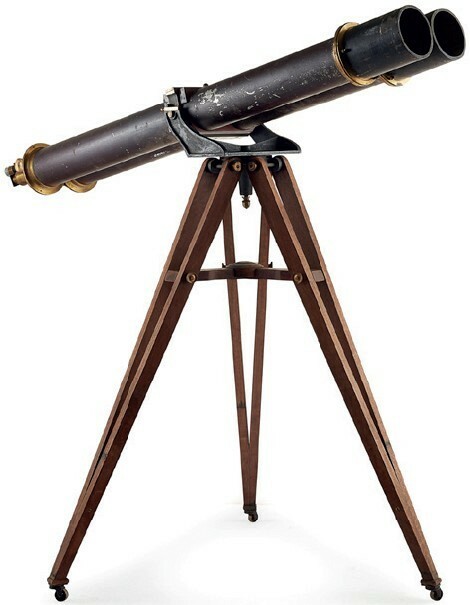 The ebony stand, giving a height of 4ft 10in (1.49m), was also 19th century. 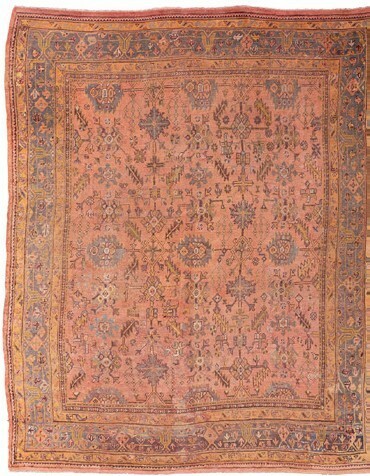 However, as a good decorative piece, it took a mid-estimate bid of £4800 from the Continent. 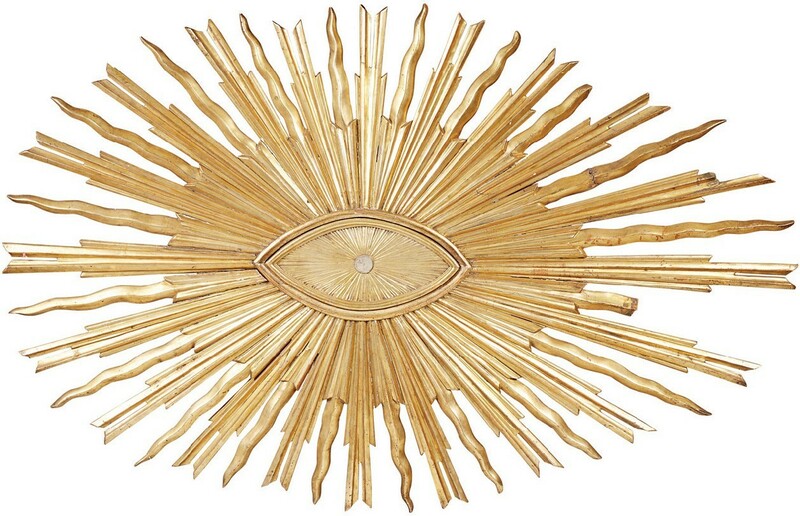 The other Continental star, from a different vendor, was the 7ft 3in (2.22m) tall carved giltwood sunburst reliquary provenanced to an 18th century Umbrian church. “I had never seen anything like it before and don’t suppose I will again,” said Girton, who gave the piece a speculative £1000-1500 estimate and saw it sell at £9500 to a buyer in the room against an American underbidder. UK dealers and private buyers generally shared the better-quality, fresh-to-market, English furniture. 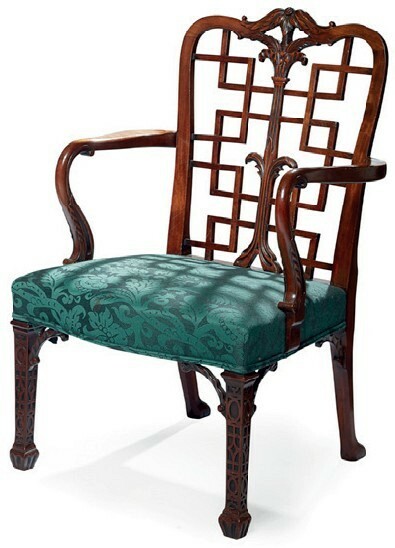 A pair of George III Chinese Chippendale mahogany armchairs with acanthus-carved serpentine top rails over trellis backs went well above estimate, selling at £7500. Also going above hopes were a Regency satinwood and ebonised centre table and an 18th century and later red japanned and gilt bureau. 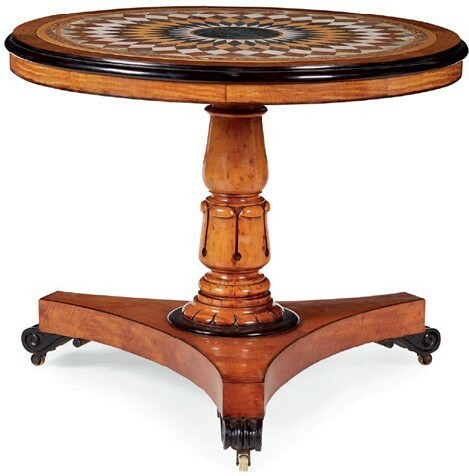 The table, with a 2ft 10in (87cm) diameter top inlaid with a band of contrasting specimen marbles and hardstones, took £6500 and the bureau, decorated to the slant and drawers with a pavilion and figures in a garden and in boats, made £4400. More functional than decorative pieces also got away. Ernest William Varley’s family firm at Whitby produced superbly crafted Georgian-style furniture which enjoyed huge success in the early 20th century. 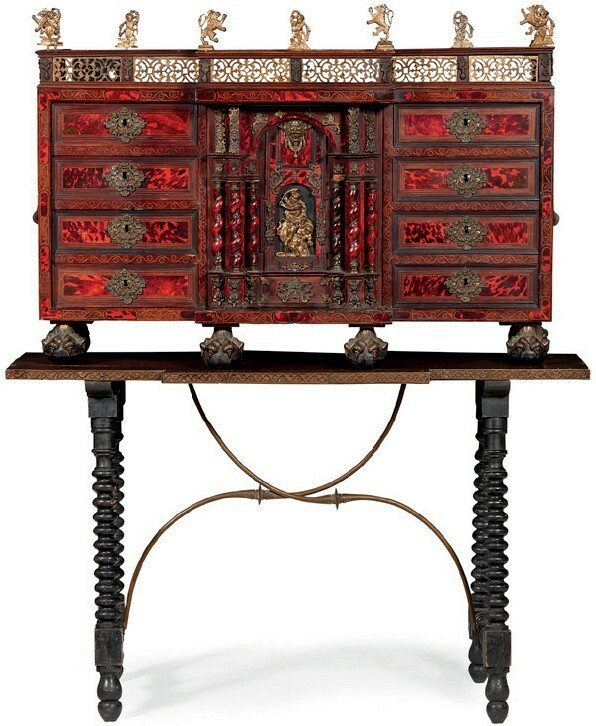 At L&T, an 8ft 8in (2.63m) tall bookcase with pagoda cresting, which owed a lot to the Chinese Chippendale style, was carved to the secretaire backboard E.W. Varley Whitby 1913. In November 2000 it rated a place in Sotheby’s sale of Important English Furniture when it was pitched at £40,000-60,000. 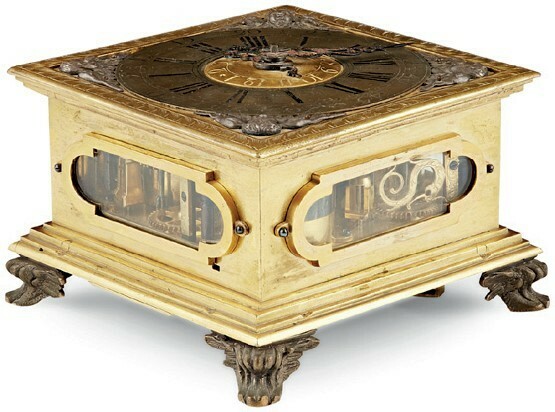 Even during the boom years that proved too ambitious for the market and in November 2013 it appeared at an Interiors sale at Christie’s South Kensington, where it got away a shade below estimate at a hammer £6800. In Edinburgh it sold within estimate at £5000.